You are no doubt pleased like me that Spring has finally arrived and the evenings are much lighter. To add to my general mood lift, the countdown to the much anticipated Royal Wedding is well underway! I read in the press recently that it is to be viewed by in excess of 1 billion people around the world. I remember too clearly the wedding day of The Prince of Wales in 1981. At the time, I was working for Government Hospitality, part of the Foreign and Commonwealth Office and we were organising a lunch at the Bank of England, hosted by the then Prime Minister, Margaret Thatcher for overflow wedding guests from the wedding at St Paul’s Cathedral. 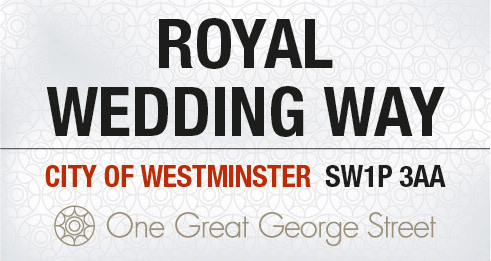 On the very same day we also organised a reception for 800 wedding guests in the evening at Banqueting House. I had never seen so many crowned heads in one place at the same time and remember the late Princess Grace of Monaco and Nancy Reagan arriving only minutes before the end of the function as if they were in competition to be the last to arrive. What was really perfect too was seeing the Prince and Princess of Wales drive through Horseguards Arch which is immediately in front of Banqueting House as they journeyed in an open top carriage on the way to the station to set off on their honeymoon. Although it was unfortunate to have to work on such a momentous day, lets face it, I too would have liked to join in the evening street parties myself. However with our offices based in a Grade I listed house in Carlton Gardens overlooking The Mall we were right in the ‘thick of the action’ and given the work we were doing we managed to probably to see more than many others that were not at work. Anyway, 30 years on and with a bit of luck, I may just be able to enjoy this momentous occasion from the comfort of an arm chair at home as I am fortunate to have a very able and experienced team who will be running the events and weddings over that weekend as we allocate a dedicated Event Co-ordinator to every event. I recently supported our Sales and Marketing team with a photoshoot and updating the content of our website’s Private and Fine Dining pages where I tried to influence and capture the spirit of our great venue and ability to host superb corporate hospitality functions. The Sales team tell me that they have had a number of enquiries already for celebration canape and drinks receptions on the actual day of the wedding, private screenings and to act as a back of house base for news stations and media companies. Our Storey’s Gate entrance, with a clear view to Westminster Abbey is literally under a minute’s walk away. If you would like to see my stab at marketing speak, you may wish to take a look at our updated Private and Fine Dining pages by clicking on either or both of these links. Very exciting times ahead, really looking forward to the 29 April 2011. It is going to be a day to be remembered for some time.